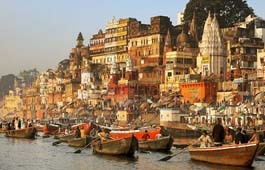 Varanasi is said to be the oldest surviving city of the world. Varanasi is also called as Kashi or Benaras. 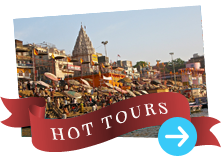 Being the most venerated pilgrim place in Hindu religion, Varanasi is said to be a museum of temples. Also called the city of temples, Varanasi is home to about 2,000 temples. Most of the temples that are located on the Ganga Ghats are old and date back to the medieval period. According to legends the first Siva Jyotirlinga, the fiery pillar of light, came through the earth here and flared into the sky. Therefore Varanasi is also called Kashi, "the City of Light." The Kashi Vishwanath temple, located near the Ganga Ghats, is the most famous and important temple of Varanasi. In this temple resides the guardian of the holy city, Lord Shiva. Other important temples of Varanasi are the new Vishwanath temple, the Sankat Mochan temple, the Durga temple, the Kal Bhairav temple and the Mritunjaya temple. Arrive Delhi our representative will meet you at arrival lounge at the airport and transfer you to hotel. After breakfast depart for full day city tour. Overnight stay at the hotel. After breakfast depart for Karauli. Overnight stay at the hotel. After breakfast depart for Agra. Overnight stay at hotel. After breakfast depart for full day sightseeing tour. Overnight stay at hotel. After breakfast depart for Gwalior. On arrival transfer to hotel. Overnight stay at hotel. After breakfast depart for city tour followed by excursion to orcha. In the evening depart for Khajuraho. On arrival transfer to hotel. After breakfast depart free time for self activity followed by flight to Varanasi. On arrival transfer to hotel. Early morning boat ride to ghats of Ganges followed by city tour. Overnight stay at the hotel. Plan your own day followed by overnight train to Delhi. Arrive delhi transfer to hotel. In the evening depart for International airport.